Malwarebytes 2.0.1 implemented minor updates from it’s 2.0 version. Database definition is now updated instantly after installation. Notifications are no longer shown if the Dash panel is in concentrate to remove unnecessary information. Significantly decreased the dimension of tray notifications. Reduced the concentration of colors used for tray notices and banner notifications in the Dashboard. Database out-of-date and has-never-been-scan notices now decreased in strength to orange instead of super red. All planned tests should now run without taking up the primary UI so that MBAM users are not interrupted. The database is fully updated. Almost as effective as Premium in terms of malware removal. General Settings – From where you can customize basic options of Malwarebytes from notification, language and explorer integration. Malware Exclusion – Any files and folders added in this area will be excluded from the scan. Detection and Protection – If you have a better understanding of customizing Malwarebytes 2.0.1 behavior, you can set it here. 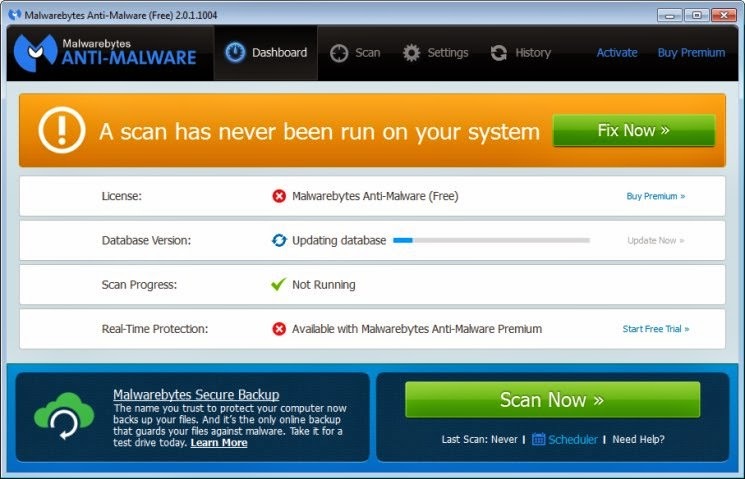 Update settings – Control the functionality of Malwarebytes 2.0.1 updates in this section. History settings – In this setting you can adjust on how Malwarebytes collects data and logs information. Web Exclusion – There are instances that Malwarbytes block certain IP’s and Domains even if it is free from any malicious script or software, you can simply add that IP or Domain here to unblock it. Malware Realtime protection is on. Malicious Website protection is also on. Access Policies – You can restrict and control the level of access for users of Malwarebytes 2.0.1. Advance Settings – This is for advance users, you can customize Malwarebytes 2.0.1 behavior in this setting. Automated Scheduling – Create and set scheduled tasks for Malwarebytes Anti Malware. The MBAM’s developers are always looking for ways to improve Malwarebytes. I am one of the people who appreciated it. They also listen to users complain even in minor areas such as colors and sizes of notifications. Looking at the advantages of being a premium user, I am convinced that upgrading to Malwarebytes 2.0.1 premium is really an option. However, just take note that Malwarebytes also change it’s license policy, it is now a yearly subscription from a forever license. What do you think of Malwarebytes 2.0.1?